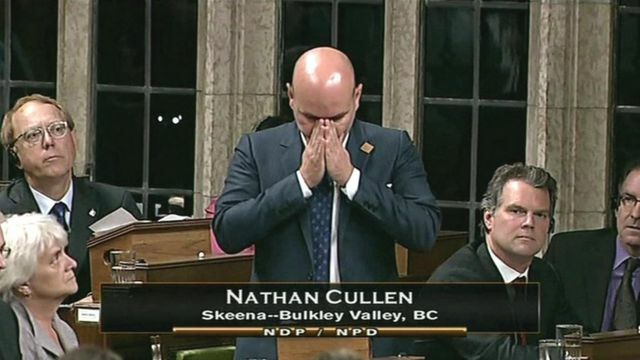 Canadian MP breaks down in Jo Cox tribute Jump to media player Canadian MP Nathan Cullen, who was a friend of Jo Cox, breaks down with emotion as he pays tribute to the late MP in Canada's House of Commons. Lord Kinnock mourns 'death in the family' Jump to media player Former Labour leader Lord Kinnock speaks of his grief at the death of Labour MP Jo Cox, saying he and his wife Glenys saw her as "a beloved niece". Jo Cox MP: In her own words Jump to media player Jo Cox made her mark on entering the House of Commons as the Labour MP for Batley and Spen. Vigil in memory of Jo Cox MP Jump to media player Hundreds of people attended the vigil in Birstall to remember Jo Cox MP. Canadian MP Nathan Cullen, who was a friend of Jo Cox, broke down with emotion as he paid tribute to the late MP in Canada's House of Commons. Mrs Cox, 41, died after being shot and stabbed in the street in Birstall Library, West Yorkshire, on Thursday.